A complete fitness provider. Exercise Equipment, Supplements, Workout Clothes, Gear, Martial Arts. Please take a look around at the products and services we offer and give us a call or email us for purchasing information. Be sure to check out the Products sections for photos and descriptions of some of our products. SHAPE UP AT NED'S: PRIVATE PERSONAL TRAINING at our Rt. 51 Whitehall location. Look below for details. We are keeping you fit with special SAVINGS. See Products for details and specials. Kettlebells now in 5 lb. increments. Ned's was founded March of 1988 and has been growing steadily ever since. We sell products to get you in shape. As well as swim wear and clothes to wear when you get the look you want. We strive to provide only the highest quality available. PAGE 1: Weight Training & Workout Gear, Weight Lifting Equipment, Weights, & Cardio Equipment. PAGE 2: Boxing and Martial Arts Products. 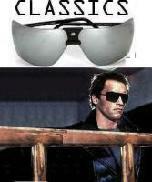 As seen on The Terminator! GARGOYLES performance eyewear is great for the Summer. 100% optical clarity and wrap around protection. Ned's Fitness Supplies is proud to be providing quality fitness products to the region and beyond for over 31 years! Private Personal Training in our new personal training studio. Get into the shape you've always wanted. Weight training, cardio equipment, & plyometrics are available now. Also Available, grappling, throwing, & striking martial arts training. Rates are: One session(1hour)-$55. Ten sessions-$440. Twenty sessions $825. If you would like to have someone trained with you, they can for 50% off. (One session-$27.50. Ten sessions-$220. Twenty sessions $412.50. These rates only apply when two people are being trained in the same session). Call (412) 884-5274 for more details.